Urban Consumer want it fresh and has the purchasing power. Exception: Apples, Oranges, Mangoes etc. they need particular climate, they can’t be grown everywhere. Asparagus, cauliflower, broccoli, spinach etc. Weeding, harvesting in veggi/fruit =require a sizeable labor force. Mechanization= not that easy like in Corn/cotton. But problem solved with the help of illegal/less-educated Mexican immigrant workers. Since product =perishable=has to be transported via truck quickly to market. California has good roads/highways=trucks cover a greater distance in the given time= area under truck farming is higher than in India or elsewhere. Los Angeles=Hollywood + Silicon Valley. Lot of people in service sector=Standard of living is high= junta diet conscious=good demand for fresh veggies/fruits. Farmers have turned into agri-business manager: marketing and distribution in corporate level efficiency. What is done to oranges? Florida Most of them turned into concentrated juice. Cali itself has a big domestic market due to Silicon Valley and urbanized, service sector oriented economy=higher std. of living=junta consumes more fruits. Florida Florida is far away from the urban posh people of NY, LA or Europe.Florida is surrounded by ‘backward’ states like Georgia and Alabama. Hence local/regional demand=not that high=> product must be concentrated (fruit to concentrated-preserved juice) before sending to faraway market. Fruit for thought: Analyze the situation for Himachal Apples, Nagpur Oranges and Andhra Mangoes. farmers extremely faraway from cities rear sheep/goat etc. As the farmer moves away from the city, number of profitable options decreases. Since Transport cost gets higher, he has to pick an activity with lower production cost (e.g. sheep grazing.) to make any profit. Although it doesn’t mean nobody grows vegetables or milk in Australia. At local scale they too have their vegetable, dairy production near their big cities. Van Thunen doesn’t apply to specialty crops such as oranges, apples- they’ll only be grown where climate/soil permits them, irrespective of proximity from market. Q. Why do Mediterranean countries lead in this grape/wine business? Climate Grapes hate cold=> not grown beyond 50 Degree North and 40 Degree south latitude. The grapevines themselves shed the ground in summer= soil remains cool + less moisture loss. soil Grapes like calcium. France-Italy hill have chalk/limestone=good for growth. The grapes grown in one farm are not same as those from another farm. Even slight variation in temperature, precipitation, sunshine, soil, drainage, manure, method of fermentation and storage can make all difference in the final wine. In California, Grapevine harvested using machine but not possible in Europe because hill slopes and small farms. Wine=non-perishable, can be stored for years, infact its vale increases with age. Wine=high value product=can withstand transportation cost. Mediterranean region =long established wine producing areas have reputation and given exclusive names. Example sherry from Spain, Champagne/Cognac from France etc. + Liquor has high demand in any part of the world. When French occupied Algeria they started grape cultivation. Why? Because French wanted to export their own premium wines to other countries, so for local consumption in France itself, cheaper variety had to be imported from Algeria. Thus, Algeria became a leading grape producing country in the region. But When Algeria won independence, the new government did not allow wine industry anymore (because Algeria=Muslim population, alcohol forbidden) =grape cultivation declined. in countries too far north = grape-cultivation not possible. Barley=gluten content too high=can’t make good breads= better make beer. Recall the ‘concentration’ principle. In China, Japan and many Asian countries because grape is not cultivated and rice abundantly available. gluten content too high=can’t make good breads. can grow in the adverse climate of central Europe. Used for whiskey making. Again recall the “concentration” principle. Government Policy State governments giving tax benefits to encourage wine industry. e.g. Maharashtra give stamp and Excise duty exemption, sale tax holiday etc. to new wine units. Other than that, books don’t give much wisdom about “location-factors” of wine industry in India. But on a non-serious note, why are desi-liquor dens located close to slum areas? raw material =non-perishable=>industry need not be setup near raw material site. In case of Aluminum refining, industry should be setup near a cheap electricity source. On the same logic, this unit should be setup near jungle/city outskirts for getting free firewood for distillation process. But in that case, finished goods has risk of getting caught while in-transit to city. Therefore it is more logical to set industry near market (Slum), rather than @energy source. can be done by even single man, as long as he has the jigar (guts) and the brewing-skill, otherwise hooch will be produced =>deaths= no repeat customers. If the unit is farther away from market (slum)=risk of getting caught during transport. Therefore, proximity to market (slum) =prime factor in deciding industrial location. Afforestation programs outside city using MNREGA labour, to increase firewood availability. Some scheme named after you know who, for providing skill upgradation and subsidized equipment, implemented with the help of local NGO. anyways, In the next article we’ll see location factors for plantation crops such as tea, coffee, rubber, sugarcane and later iron-steel industry etc. Why do European producers have supremacy in the wine industry? What factors give rise to truck farming industry near urban areas? Illustrate with examples. Farmers away from urban areas usually grow cereal crops. Comment. Analyze the factor responsible for underdevelopment of Dairy industry in tropical regions. 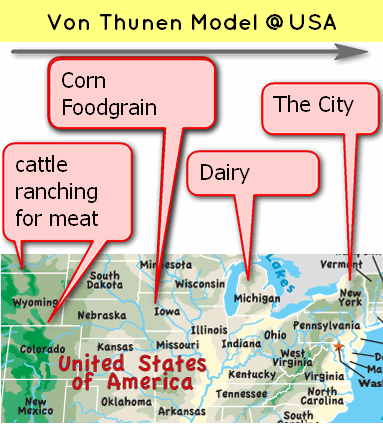 In USA, certain groups of states are known as dairy belt, cotton belt and Corn Belt. Explain the factors responsible for such regional specialization of agriculture. Discuss the major geographical and economic factors influencing the location of livestock farming in different parts of the world. Examine the factors responsible for large production of corn and Wheat in the North America and compare it with suitable states of India. Lol @ Desi Liquor.. How do you come up with such gems!!? desi liquor should be in ” make in india” campaingn by shri Modi ji :D ..on a serious note good article..
That of the production of corn and wheat in America and comparison. Should i be generalistic in these types of question or should i make a proper table comparing every aspect i detail?? Amd then again factors of corn and wheat are poles apart! !